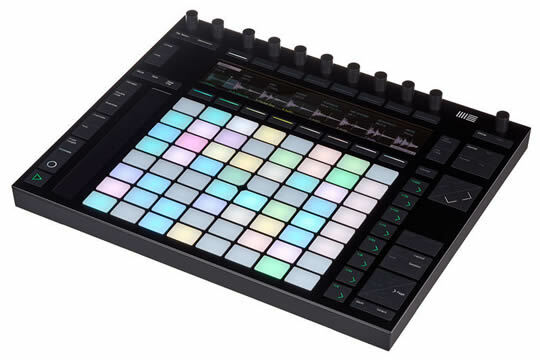 Ableton's Push 2 is an instrument that puts everything you need to make music at your fingertips. It is a powerful, expressive instrument that gives you hands-on control of a vast array of sounds without needing to look at a computer. Push's grid of 64 pads allows you to play or program beats, melodies, and harmonies using three divided sections: Play in real time, step sequence, and adjust the length of your loop at the same time. When playing melodic instruments, Push’s pads correspond to pitches, allowing you to play notes and chords. The Slicing mode allows each pad to play back a different slice of a sample. Adjust the Sensitivity to control how many slices are available, or tap an empty pad to manually insert your own slices as the sample plays back. The multicolor display is constantly adapting to show you exactly what you need, with pads that are carefully made to feel just right for musicians of all kinds. The control buttons are seamless, nearly flush with the surface, and provide a subtle “click” when pressed.